In 2003, Le Dindon was brought to life in the small town of Voiron, France - during a time when e-commerce was still a new concept. Ever since its conception we've been a small family business with small town values that we bring to our modest website. Here you're not just another customer - your a part of the Le Dindon family. 5. Quick and individual answers to each email - we know our products and our customers! In essence: We strive for impeccable customer service and want to give you a sense of having an actual human behind your computer screen. We're not the type of company to hide behind a paid number or leave you hanging without the proper information. An Internet site with a corner-shop feel, it's possible!!! Today the Internet is full of "super-discount sites" that try to give you the lowest prices. While they propose attractive prices, there's no miracle : having the lowest prices usually equals awful customer service (particularly after sales). We're really upset with the way commerce seems to be heading (both on the Internet and in general), it seems like the world of sales turns around 2 ideas : low prices (meaning detestable customer service) and plenty of advertising (basically buying your clients because there is no time to create a better service by slowly growing and adjusting to meet the needs of your customers). Since the beginning, Le Dindon has grown slowly mostly through word of mouth and natural SEO. We refuse to advertise in any form. Our 100,000 customers (very happy, of course) are proof enough that we can exist without imposing our image in every public space available. Like most Internet sites that have been around for a long time, we started our business from our garage. In 2007 the number of orders became too much for us to handle alone and we decided to work with the association AFIPH/Act'Isère. They employ people who are mentally handicapped to work and integrate themselves in the workforce. 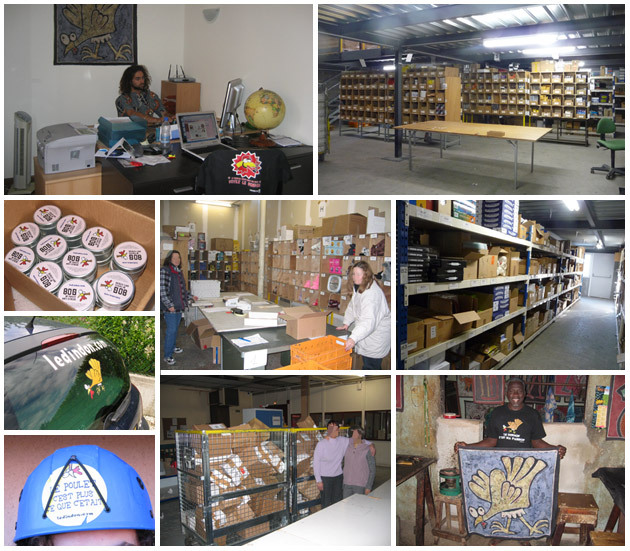 For the last 10 years these workers (along with their monitors) have handled the tasks of receiving and stocking our merchandise, as well as preparing and sending out all your orders. They work very well and errors are extremely rare. If you ever have a problem with your order, please don't get upset, our workers are only human. Let us know and we will find a solution to your problem quickly. We are proud to help, in our own way, with integrating these wonderful people into our society. Through their work, they are not only productive, but build confidence in themselves, and increase their self-esteem. It is a win-win situation any way you look at it for all parties involved. It's so good to shop on a little e-commerce website!